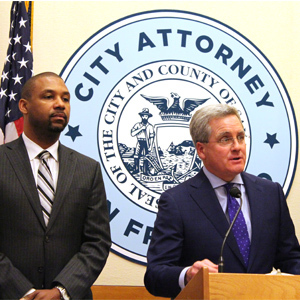 SAN FRANCISCO (March 19, 2019) — City Attorney Dennis Herrera and Supervisor Shamann Walton today announced joint steps to curb the epidemic of youth e-cigarette use, which has erased more than a decade’s worth of progress in reducing youth tobacco consumption. San Francisco, along with the City of Chicago and the City of New York, sent a letter to the FDA this morning demanding that the FDA do its job and immediately conduct the required public health review of e-cigarettes that, by law, was supposed to happen before these products were on the market. By a companion letter, San Francisco requests the FDA to turn over records on an expedited basis to the City Attorney’s Office to help San Francisco independently determine whether legal action against the FDA is needed if the agency fails to undertake the required public health review. In coordination with the City Attorney’s Office, Supervisor Walton is introducing ground-breaking legislation at the Board of Supervisors today that would prohibit the sale in San Francisco of any e-cigarette that has not undergone FDA review. Under this legislation, any e-cigarette that is required to have, but has not received, FDA premarket review could not be sold at a store in San Francisco or bought online and shipped to a San Francisco address until the FDA completes its review and allows the products to be sold. This is not an outright ban on e-cigarettes. It’s a prohibition against any e-cigarettes that haven’t been reviewed by the FDA to confirm that they are appropriate for the protection of public health. So far, no e-cigarettes have been put through the review process that is required by law. Instead, the FDA has proposed extending the deadline for e-cigarette companies to submit applications for premarket review, which would allow e-cigarette products to be on the market for 15 years without the required public health review. In coordination with the City Attorney’s Office, Supervisor Walton is introducing a separate piece of legislation today that would prohibit the sale, manufacture and distribution of all tobacco products, including e-cigarettes, on City property in San Francisco, including Port property. The legislation would prevent another situation like e-cigarette company Juul Labs subleasing property on San Francisco’s waterfront or any other City property. It would also prevent Juul from expanding on City property if doing so would result in the company engaging in the above prohibited activity. The City Attorney, as part of his review of Juul’s operations, sent notice today to Juul and the Pier 70 developer seeking an explanation for why Juul holds a tobacco distributor license at that property when it has maintained that it “does not engage in the sale of cigarettes or tobacco products” on the premises. Tobacco use is the leading cause of preventable disease and death in the United States. Tobacco kills more than 480,000 people a year in this country. That’s more than AIDS, alcohol, car accidents, illegal drugs, murders and suicides combined. The percentage of middle and high school students using tobacco products was at an all-time low in 2017. But last year, according to the Centers for Disease Control and Prevention, tobacco use among youth rose for the first time since the 1990s. This dramatic reversal is directly attributable to the nationwide surge in e-cigarette use by adolescents. In 2018, the number of middle and high school students who reported being current users of tobacco products increased 36%. Last year 4.9 million American students reported they were using tobacco products, up from 3.6 million students in 2017. Use of e-cigarettes increased by 77.8% for high school students, and 48.5% for middle school students. Information about effective ways to quit smoking can be found at smokefree.gov.